Mike Eruzione and Mark Johnson were quick to mention it, and each continued to stress the point: The Miracle on Ice -- the United States' win against the heavily favored Soviet Union at the 1980 Lake Placid Olympics -- may be the defining moment in American hockey history, but without a number of other big moments, the story would be incomplete. "As great as the Soviet victory was, I think sometimes what gets lost in the shuffle is how important that game was against Sweden, and the game against Czechoslovakia," Eruzione said Monday. "Sometimes a lot of the success of our team gets lost in one game. "I want people to remember it was a series of events and a series of games." The history of college hockey is replete with lengthy tenures by some of the game's great coaches. But for more than 60 years, one family has led the hockey program at the United States Military Academy at West Point. It's a lineage that has outlasted almost every other in the world of sports. "We feel we have a great deal to offer a young man both on and off the ice. It's more about the opportunities than the challenges. That's what we try to focus on, the opportunities," Army coach Brian Riley said. "They're set up for success once they make that decision to come to West Point." After serving 14 years in two stints as an associate and assistant coach, Brian Riley took over the Army program in 2004 from his older brother Rob, who led the Black Knights to 257 victories in 19 seasons at West Point. That's an impressive total for any coach at one program, but for Rob Riley, it's not even the most wins by a member of his own family. That's because when the eldest Riley sibling took over the Army program in 1986, he succeeded his legendary father, Jack, whose 542 victories at West Point still rank 15th in college hockey history. Jack and Rob Riley are the winningest father/son pair in college hockey. "Now that I can sit back and reflect, you do kind of say wow," Rob Riley said. "When you're in the middle of it, you don't even have time to realize it. There aren't that many guys who are at one place for 20 years. Then Brian comes in and adds more to that. It's something we're all very proud of." Former NHL player and Stanley Cup champion Danton Cole can remember his college playing days as if they were yesterday. Now head coach for the United States Under-18 National Team Development Program in Ann Arbor, Mich., he has had March 1 circled on his calendar since the start of the season. The fact his charges will battle his alma mater, Michigan State University, at Munn Ice Arena on the same day that USA Hockey celebrates "Try Hockey for Free" as part of its Hockey Weekend Across America campaign is an added bonus. The game will be the final one for the U.S. U-18 NTDP against college competition this season. Cole has led his charges to a 7-8 mark against NCAA foes in 2013-14. Twenty-one years ago, the Minnesota North Stars franchise took a leap of faith by leaving the State of Hockey for uncharted territory in Dallas. That's when Mike Modano took the lead on a grassroots campaign to educate Big D about the game, knowing full well the learning curve would be steep. Fans grew to enjoy the speed and contact of the game over time, but they had a lot of help along the way. Stars public address announcers noted each time a whistle was blown for offsides or icing. According to Modano, it seemingly took 10 years to explain a plus-minus rating to the new hockey fans. "Trying to explain the rules and offsides and icing, and people cheering when guys got penalties on our own team … just because they announced our team and our player, they cheered," Modano said. "There was a lot of crash-course teaching we had to do." Calling all USA Hockey fans! If you possess a jersey of your favorite American-born player or team, consider donning the old replica on Friday when Hockey Weekend Across America kicks off a three-day celebration of the sport throughout the United States. "Hockey Weekend Across America is one of the marquee events on the calendar each year," USA Hockey executive director Dave Ogrean said. "This year will be unique as we'll celebrate Hockey Weekend Across America the weekend immediately following the conclusion of the Olympic Winter Games." CHICAGO -- At first glance, it looked like the Chicago Blackhawks decided to hold an off-day skate at the outdoor rink located inside Soldier Field for this weekend's OfficeMax Hockey City Classic. A closer look revealed something much different. The Blackhawks were indeed out there Saturday morning in chilly temperatures, but they were not by themselves. Joining them, also wearing Blackhawks practice jerseys, were members of the USA Warriors Ice Hockey Program, which trains and supplies injured servicemen and women with hockey equipment and skills to use the sport as a rehabilitation tool. After separate deployments to Iraq and Afghanistan, Sgt. Michael Wichmann wasn't expecting to find too many traces of his favorite sport when he reported to Fort Benning in Georgia to serve as a motors instructor. With thousands of servicemen training and working at the famous base, the Michigan-born Wichmann didn't foresee many hockey opportunities in the heart of the south. 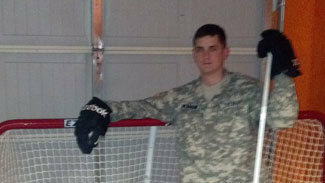 The 23-year-old previously was stationed at Fort Benning in 2006 and, except for the nearby Columbus Cottonmouths of the Southern Professional Hockey League, didn't recall much hockey being played. He was pleasantly surprised when he returned in 2011. "They have two rinks here and one wasn't here in 2006," Wichmann told NHL.com. "So I really was surprised there was a lot of military members here who play hockey. It's not something that you run into on a military base. A lot of guys that you talk to don't even know what hockey is. There are about 35 of us on the Fort Benning team alone." After three years of winning the 30-and-older silver division at the National Pond Hockey Championships in Eagle River, WI, the Waupun Wolves team from Waupun, WI, knew it was time to take a big step at the popular annual celebration of outdoor hockey. So they made the jump to the tournament's gold division, the top tier in the weekend-long festivities in which hundreds of teams compete for titles in 16 different divisions. "This was the first year we moved up to gold. Being over 30, we thought we were going to get smoked," Waupun's Cory Buchholz said. "We have one guy who played D-III college hockey and the rest of us played junior hockey, so we thought we weren't going to handle it too well." ST. PAUL -- While hockey fans in the United States were watching NBC's coverage of Hockey Day Across America today, fans in Minnesota were experiencing it first hand. Just a long slap shot away from Xcel Energy Center, located in the heart of downtown St. Paul, Landmark Plaza was host to NBC's pregame coverage as well as a whole host of activities, all hockey-centric. The festivities had already begun when Liam McHugh, Mike Milbury and Pierre McGuire went on the air at 11 a.m. local time. USA Hockey's first youth American Development Model clinic got under way from the Wells Fargo Winterskate at 10 a.m., a refrigerated outdoor rink set in the middle of the park, surrounded by streets and skyscrapers. The kids skating behind the NBC crew were mostly under 10 years old, with many in the 7-8-year-old range. Coaches on the ice were from USA Hockey, volunteering their time in an effort to spread the mission of the ADM, a program designed by USA Hockey to give kids more touches, more opportunities to play and to reduce costs for parents. "Activities for all sports, not just hockey, are rising," said Terry Evavold of Sartell, Minn., the director of the ADM for Minnesota Hockey. "So we have to find a way to reduce those costs and get more kids playing."